"Rebecca makes my aches and pains go away." "The deep tissue massages I received from Rebecca were the cure for the pain I was suffering and was far superior to any physical therapy I have ever had in the past! They made me feel so invigorated and able to move about without the pain from before the massages." This innovative treatment focuses on centering the 7 major chakras, or energy centers, using a variety of techniques. Each chakra is a primary energy center, linking physical, spiritual and emotional wellbeing. For maximum vitality, balance must be maintained between the chakras. Essential oils, gemstones, massage and Reiki are used in this relaxing and healing treatment. The combination of these techniques restores balance to the whole body and mind, increases your energy and your ability to be present within your body. The new Face Lift Massage can give you a more youthful, relaxed, vibrant appearance! The treatment consists of cleansing the skin using warm towels to ready the skin. A full 30 minutes is devoted to massaging your face with aroma-therapeutic oils and creams and certain acupressure points being addressed. A hot towel foot treatment completes the session. With repeated Face Lift Massages in weekly sessions you will begin to see noticeable changes in your face and neck. Once the face is toned is will be easier to keep it in shape with monthly maintenance sessions. I recommend a series of 6 or 12 weekly sessions followed by monthly sessions to gain the most benefit, but please feel free to try this massage as often as you like! Address those key tension areas in the back, neck, shoulders and arms. This short, focused massage is done over the clothing in a specially designed ergonomic chair. The ultimate in convenience: It's short, no need to undress and Rebecca can bring it right into your office. Feel looser than you ever have before. With this traditional massage, which is done over the clothing, Rebecca will combine Shiatsu style acupressure techniques as she puts your body into deep, but gentle yoga stretches. A regular stretching program can lengthen your muscles and make daily living easier! Learn how to stretch correctly...learn different kinds of stretches...learn the stretches that will benefit you! You relax...and still gain the benefits of stretching. "Best of all is that you are easy to talk to, and that you really care enough about my body to give me ideas, exercises and stretches to help me to continue to feel good, even after the massage." A blend of warm melted shea butter, beeswax and soy extracts that penetrates easily and leaves the skin amazingly soft is applied and then your hand or foot is cocooned in a heated mitt for 20 minutes or longer. Perfect for arthritis, carpal tunnel, poor circulation. This treatment can be added to any other massage or spa service. Not sure what kind of massage to ask for? Don't worry. Rebecca will sit down with you before your first massage for a private consultation. She'll find out about your unique needs and preferences and make specific recommendations so that you receive a massage that's just perfect for you. Don't settle for a standard, run of the mill massage. 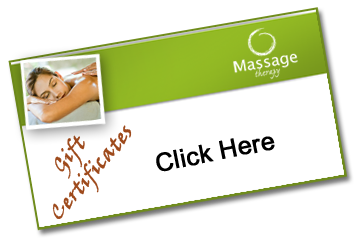 Take advantage of Rebecca's special Joliet massage gift certificate and you'll discover how great this personalized approach can be.